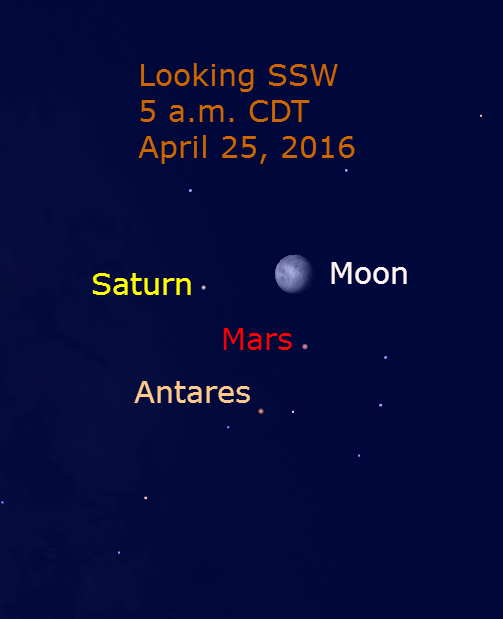 On the evening/morning of April 24/25, the moon appears near Mars and Saturn in front of the stars of Scorpius with its bright star Antares. Mars is nearing opposition (May 22) and it is the brightest “star” in this part of the sky. At this opposition, it is about 45 million miles from Earth. Mars appears about 4 degrees below the moon. Ringed Saturn is dimmer and is approaching its opposition (June 3). It appears nearly 6 degrees to the left of the moon. The star Antares is distinctly reddish in appearance. Views through binoculars accent its color. The star’s name is sometimes translated as the “Rival of Mars,” but at this time, Mars is over 6 times brighter than its stellar nemesis. The star is one of the largest known to astronomers, yet its immense size is reduced to a point of light by its distance of about 600 light years. The chart above shows the grouping at 5 a.m. CDT as seen from the Chicago area. The moon rises just after 10 p.m. CDT on April 24. So for those observers who are up late, the grouping appears low in the southeast around midnight. As the night progresses, they appear farther west and by 5 a.m. (April 25), the group is in the south-southwest.